As I mentioned in the previous post, Ariana and I have become ¨regulars¨ at La Cholita–frequenting the restuarant at least once a week to get our parrilla fix. But we aren´t the only one´s in BA that know about the deals to be had there, so there is often times a wait to get in (get there after 10 O´clock, and you´re not leaving until 1 or 1:30…no, I´m not joking). Luckily, right next door is a resturant called Cumana. 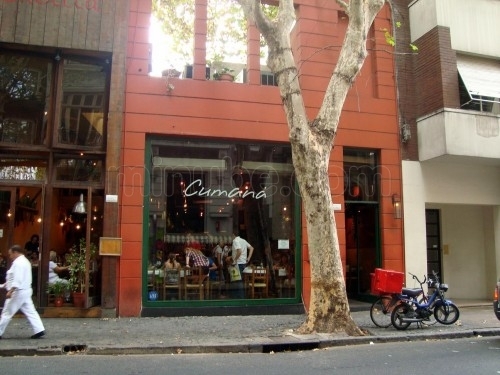 It is the same price point as La Cholita, and the food is equally as delicious, but the menu offers a completely different selection of Argentine cuisine. Rather than parrilla, Cumana serves up food typical of the Northern region of the country, including homemade cazuelas, pizzas, calzones, empanadas, and potato dishes. Most people show up with the intentions of eating at either La Cholita or Cumana, but inevitably put down their name for both once they see the crowds waiting outside. Pretty much, which ever restaurant can accomodate the party first wins. Nobody goes home upset! Inside Cumana, you will find an equally mixed crowd of locals and tourists. The locals come becasue the prices are unbeatably cheap, and the tourists come to sample a wide variety of the delicious cazuelas, which are thick and hearty stews served in lerge clay vessels. They come out steaming hot, and they never seem to cool off…you will still be blowing on the last spoonful (if you can even manage to eat that much of these filling casseroles, of course!) Some of the cazuelas are simply legumes, others include meats such as chorizo and beef, and then of course there are those that offer a mixture of vegetable and meat. My favorite cazuela at Cumana is the one with Lentejas y Chorizo (lentils and sausage). The menu simply reads Cazuela de Lentejas, but the Chorizo is a delcious surprise that adds a nice smoky flavor to the dish. 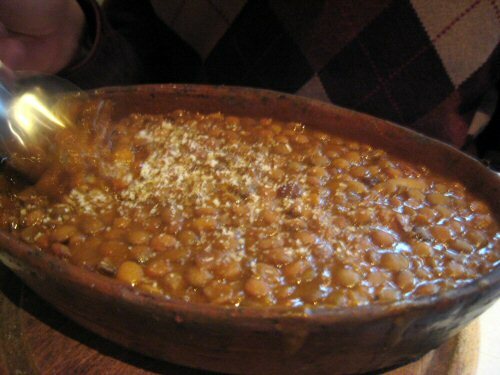 The lentils are cooked to a tender perfection and the meal overall is like a hug in your belly. I also hear that the Cazuela al Pastor is incredible, although I have never gone to Cumana hungry enough to tackle the dish myself. The waiter described it almost like a Sheppard´s Pie, layered with hearty ground beef, mashed potatoes, and cheese. Again, this is all baked and served in a large clay pot (it is on my list of things to eat in the very near future!). 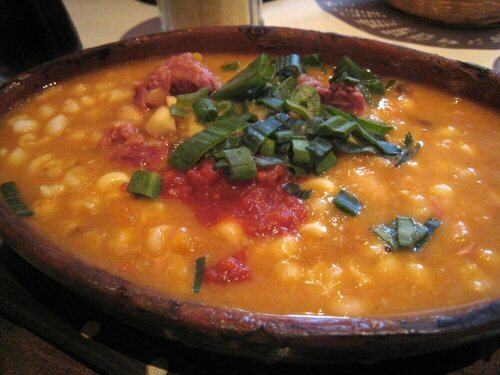 When I don´t order the Cazuelas de Lentejas, I go for the Locro–a thick soup made with beans, potatoes, squash, ham, and chorizo. It is like Pasta Fagiole on steriods, and without a doubt a ¨stick to your ribs¨ kind of meal. Although the locro is very delicious at Cumana, I must be honest an admit that there is one better at La Cocina on the corner of Puerrydon and Santa Fe (the review is coming soon!). If your craving more than soup, I highly, highly, highly, recommend the pizza and calzones at Cumama. There is some special ingredient that they use, which makes the flavor of the pizza very unique. I can´t figure out if it is an herb, or if it is special cheese, or what. I am a pretty good food detetctive when it comes to identifying ingredients, but they have me absolutely stumped. Normally, I would ask the waiter for the secret, but given the language barrier, I am left to wonder. 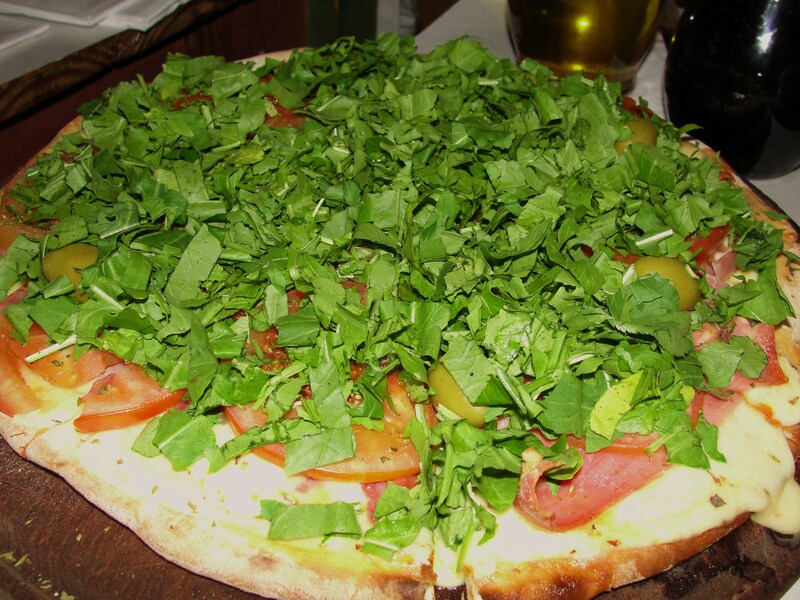 I like the Rucola Pizza with Fresh Sliced Tomato, Cured Ham, Mozarella, Tomato Sauce, and Oregano. It is salty, gooey, goodness. The calzones are also enourmous and look amazing (definitely enough for two people to share). If you´re looking to eat soemthing I little lighter, as I was the other night, it´s not gonna happen here. 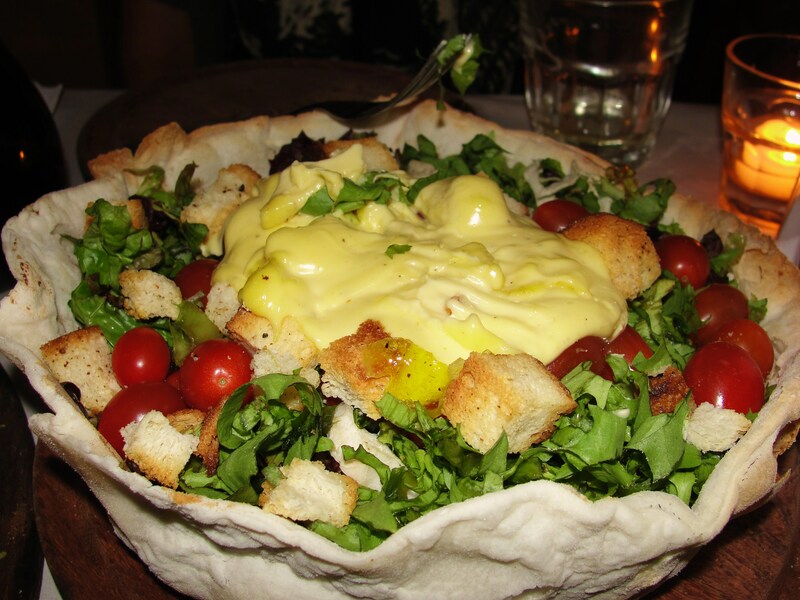 I ordered the Ensalada de Cumana thinking that the vegetables would be healthy, but the salad came out in an enourmous baked bread bowl, topped with gobbs of mayonnaise. All of my biggest ordering errors in Argentina have involved salad and salad dessings. The menu will often read; ¨vinaigrette a la casa,¨ ¨ceasar dressing, and ¨dressing especialidad.¨ But do not be fooled….these are just synonyms for disguising the word mayonnaise. And not a drizzle of mayonnaise, an overwhelming heaping of it (see photo below). The moral of the story; order your salad plain and ask for a side of oil and vinegar. Otherwise, you might as well have just ordered the fattiest steak on the menu. Of course, once I removed the top layer of mayo covered lettuce, the salad was delicious. But I hate having to operate on my food before it becomes edible.